Ricky Stenhouse, Jr. (#17) looks to make a quick lap. After the sun set on Daytona Beach a few weeks ago, NASCAR found itself with a whirlwind news story. The #3 car returned to victory lane for the first time in 20 years at Daytona, 20 years after Dale Earnhardt finally won the race. But, most of the news stories weren’t about Austin Dillion and the 3, a lot of media attention surfaced around the young man who finished in second place, Darrell “Bubba” Wallace Jr. The driver for Richard Petty Motorsports in the #43 car is the first full time African-American NASCAR driver in the Cup Series in 50 years. In a age and sport where money is everything, Bubba hasn’t always had it easy. Last year, he was released from his Roush Fenway Xfinity ride midway through the season because he had no sponsors. He was then given an opportunity by Richard Petty, filling in for the injured Aric Almirola. After he finished second in the Daytona 500, Wallace was seen after the race giving an emotional interview, capturing the heart of fans everywhere. Bubba was the center of media attention all Speedweeks long in Daytona, running from media event to interviews with news outlets along the likes of The Guardian and USA Today. He even had many prominent African American athletes wish him luck in the race, or give him high praise, such as F1 World Champion Lewis Hamilton, and baseball legend Hank Aaron. Matt Kenseth, one of the drivers who retired after this past year, Celebrates his win in the 2017 Can-Am 500. Every sport goes through some sort of change. This change is the biggest NASCAR has ever had, between new, young drivers, new car designs, and new rules packages are going to change the sport for the better. 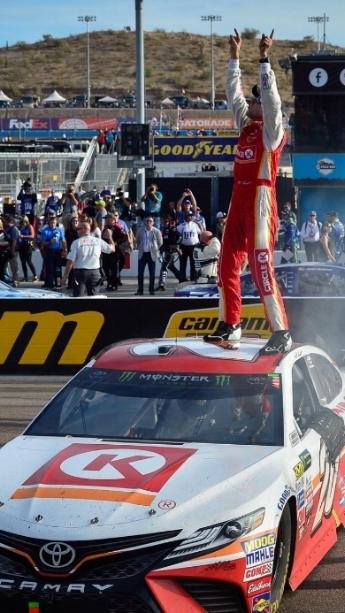 NASCAR is full speed ahead, racing for the chance to be in the national spotlight once again, and out of the dying spotlight that has been hovering over the sport for a decade.